An Albion College professor believes that by the college’s 200th birthday, it will produce a net total of zero carbon emissions. A film recently shown to the college highlights how Albion could achieve this goal. Last Wednesday, Feb. 12, as a part of Albion College’s Year of Sustainability, the film Switch was screened for faculty and students to offer a broader perspective on environmental challenges Albion faces. The film presents the efforts of companies and countries throughout the world to meet the growing demand for energy and the effects of those efforts on natural resources, the environment and the future. Examples ranged from Norway’s completely renewable hydroelectric power system that provides 99 percent of the countries electricity, to the hundreds of years of coal reserves that still exist within just Wyoming. A variety of energy sources and policies along with the tectonic forces shaping the global energy industry critically examined. Switch received critical acclaim and praise for avoiding politics and being faithful to no ideology by publications such as The Washington Post and Forbes. The film has also garnered many awards from environmental film critics such as the American Conservation Film Festival and the Environmental Film Festival. According to Douglas White, professor of biology and associate director of the Center for Sustainability and the Environment, much like Shift, the Year of Sustainability has been received well by the college community. “Many staff, faculty, and groups have adopted the sustainability theme for events and presentations,” White said. 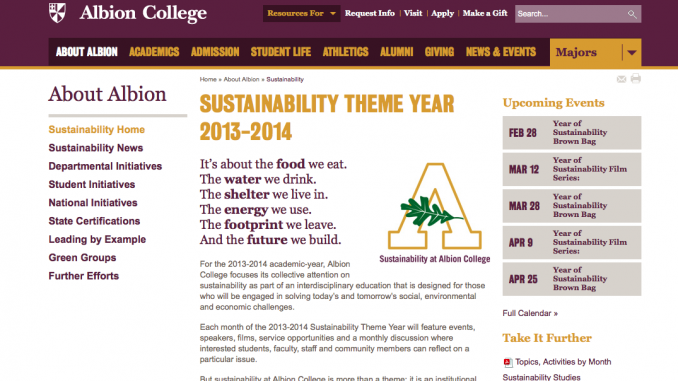 White understands the Year of Sustainability’s impact on the college and students. Beyond teaching students to be environmentally conscience and literate, the college is beginning a dialogue that includes faculty and staff as well, according to Thomas Wilch, professor of Geology. The Year of Sustainability continues with a lecture by Sean Reed, executive director of the Clean Energy Coalition, at 7:30 p.m. in the Bobbitt Auditorium on Feb. 20. The Switch Energy Project, the umbrella group that produced the film, also plans to continue its work by launching a broadcast/webcast series in 2015 to explore the issues raised in the film and offer technologies and policy recommendations to address those problems.